(Mississauga, Ont.) 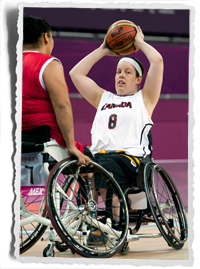 Tamara Steeves, of the Canadian women’s wheelchair basketball team, has been named the 2012 Athlete of the Year with a Disability by the Mississauga Sports Council. A native of Mississauga, Steeves made her Paralympic Games debut at London 2012 in her rookie season with the senior women’s national team. Team Canada placed sixth at the Paralympic Games. Steeves appeared in three games for Canada, averaging 5:37 minutes per game and registering two rebounds. All of the Mississauga Sports Council award winners will be honoured at the 39th annual sports dinner on June 6, 2013 at the Capitol Banquet Centre. The Mississauga Sports Council Awards recognize local athletes, coaches and volunteers for their exceptional achievements and contribution to sport. This award is the latest accolade for Steeves, who also received the Queen Elizabeth II Diamond Jubilee Medal and was named the 2012 ParaSport Ontario Female Athlete of the Year.